Beware Britain. The final post-Brexit trade deal with America will bring with it all sorts of public health dangers – not least, the reduction of very high food standards. Britain has one of the safest food chain systems in the world – America is listed as the 7th worst in the world. It is estimated that with current US food poisoning rates translated to Britain’s population, the NHS will be picking up an additional cost of £1billion. This latest piece of information only goes to highlight just how far the American’s will go to make a buck. 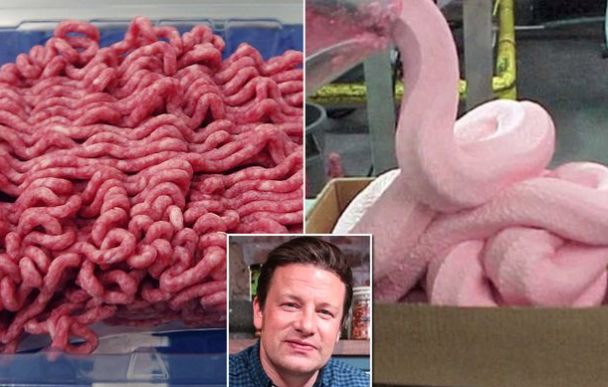 By Robin Shreeves MNN: Remember the “pink slime” controversy from earlier this decade? It was a name given to a ground beef filler by the media and popularized by celebrity chef Jamie Oliver. The company that produces the product, Beef Products Inc., called it “lean, finely textured beef” (LFTB). The USDA’s Food Safety and Inspection Service (FSIS) has given the go-ahead for the South Dakota company to label the product ground beef, according to The New Food Economy. The filler is made from beef trimmings that previously had been used for pet food, but more recently became an additive to ground beef that humans consume. When fat is trimmed away from the bone, some meat is attached to the fat. Those trimmings are sent through a process that uses centrifugal force to separate the fat from the meat. The lean meat is turned into something that looks akin to pink soft serve ice cream — hence the name — and added to some brands of ground beef to add bulk inexpensively. The addition of this substance to ground beef doesn’t need to be disclosed on packaging. The substance formerly known as LFTB is a product made from beef, but its appearance is unappealing. However, the controversy surrounding it goes beyond appearance or even the fact that its addition to ground beef doesn’t need to be disclosed. Beef trimmings are easily contaminated with bacteria such as E. coli or salmonella, so they need to be sterilized with “a puff” of ammonia, as New Food Economy describes it. Between the unsavoury images circulating in the media, the public’s realization that this substance was in ground beef and they didn’t know it, and the use of ammonia to sterilize it, the existence of LFTB became a big story. In 2012, ABC News ran an exposé on the substance. (Beef Products, Inc sued ABC News after sales of LFTB went down, and the suit was settled out of court.) Jamie Oliver started a petition asking McDonald’s to remove it from its burgers. McDonald’s did remove the substance but denied it was due to the petition, saying the removal of it was already in the works before the controversy began. Schools, which were eligible to receive ground beef that contained LFTB, were given a choice by the USDA to opt out. Eventually, the story died down. But, it’s back in the news now because of the USDA ruling that Beef Products Inc. can call it ground beef. Now that it can be labelled as such, it could conceivably be sold to the public and labelled ground beef, although there don’t seem to be immediate plans to do so. The substance’s name isn’t the only change. The product that can now be labelled ground beef isn’t produced the same way it was before. Beef Products Inc. says it has improved the way it creates the meat paste, but it isn’t sharing any details. So we’ll have to wait and see how this plays out.